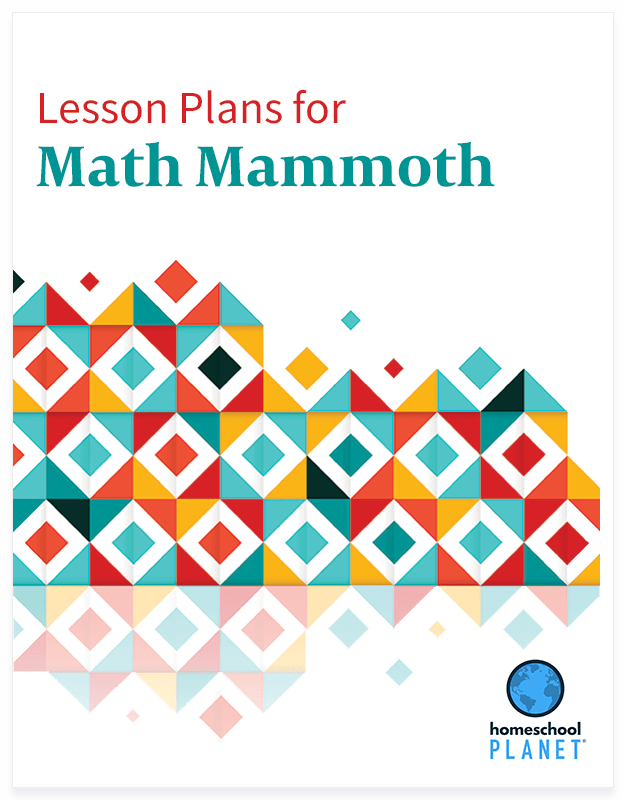 Take full advantage of your Math Mammoth Light Blue Series curriculum with these lesson plans, developed by Maria Miller, the creator of Math Mammoth. 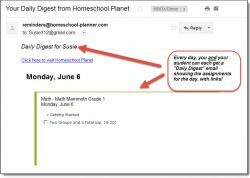 Each lesson plan lays out her recommended course of study in Homeschool Planet, with one-click access to a wealth of supplemental, recommended resources. 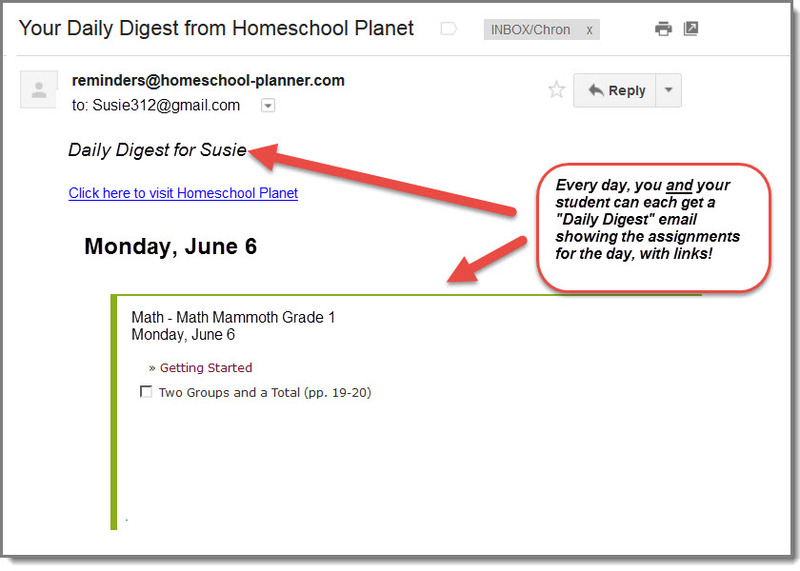 PLUS plans also include a PDF version, with links, of the entire lesson plan for the applicable grade level. Math Mammoth Grade 1 Lesson Plan assigns the lessons and tests from Math Mammoth Grade 1 curriculum over a period of 179 days. This schedule includes one day for each of the 8 chapters for additional review as directed by the parent, and 8 days for the chapter tests, so in reality, the material from the student book is covered in 163 days. Math Mammoth Grade 2 Lesson Plan assigns the lessons and tests from Math Mammoth Grade 2 curriculum over a period of 185 days. This schedule includes one day for each of the 10 chapters for additional review as directed by the parent, and 10 days for the chapter tests, so in reality, the material from the student book is covered in 165 days. Math Mammoth Grade 3 Lesson Plan assigns the lessons and tests from Math Mammoth Grade 3 curriculum over a period of 195 days. This schedule includes one day for each of the 10 chapters for additional review as directed by the parent, and 10 days for the chapter tests, so in reality, the material from the student book is covered in 175 days. 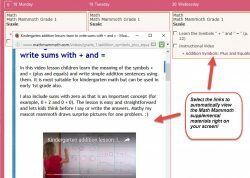 Math Mammoth Grade 4 Lesson Plan assigns the lessons and tests from Math Mammoth Grade 4 curriculum over a period of 190 days. This schedule includes one day for each of the 8 chapters for additional review as directed by the parent, and 8 days for the chapter tests, so in reality, the material from the student book is covered in 174 days. 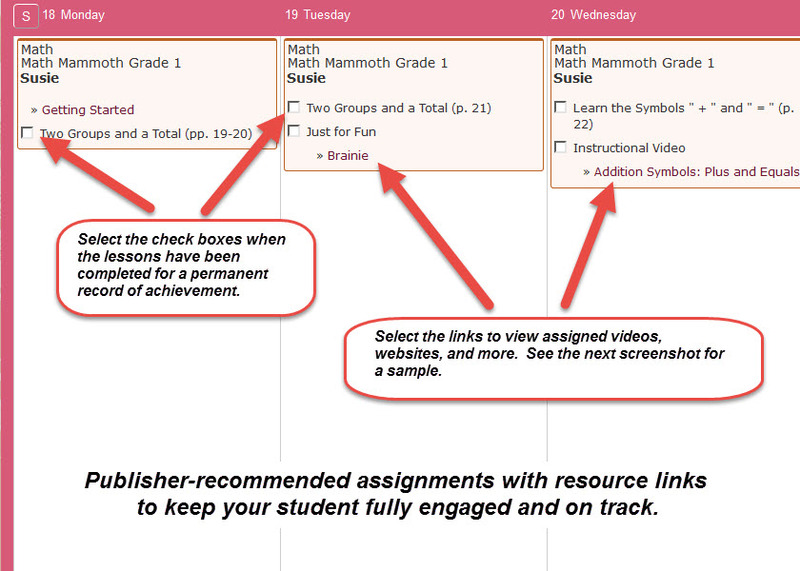 Math Mammoth Grade 5 Lesson Plan assigns the lessons and tests from Math Mammoth Grade 5 curriculum over a period of 190 days. This schedule includes one day for each of the 8 chapters for additional review as directed by the parent, and 8 days for the chapter tests, so in reality, the material from the student book is covered in 174 days. 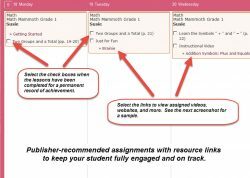 Math Mammoth Grade 6 Lesson Plan assigns the lessons and tests from Math Mammoth Grade 6 curriculum over a period of 184 days. This schedule includes one day for each of the 10 chapters for additional review as directed by the parent, and 10 days for the chapter tests, so in reality, the material from the student book is covered in 164 days. Math Mammoth Grade 7 Lesson Plans: To accomodate different needs, Maria has created three different versions of the Grade 7 lesson plan. You get all three with your purchase. The Math Mammoth Grade 7 (PreAlg) Lesson Plan assigns the lessons and tests from Math Mammoth Grade 7 curriculum over a period of 187 days. This "Pre-Algebra" version includes the chapter on the Pythagorean Theorem but not the chapter on statistics (in contrast, the grade 7 "Long" version includes both, and the "Regular" version includes the statistics, but not the Pythagorean Theorem). The schedule includes one day for each of the 10 chapters for additional review as directed by the parent, and 10 days for the chapter tests, so in reality, the material from the student book is covered in 167 days. 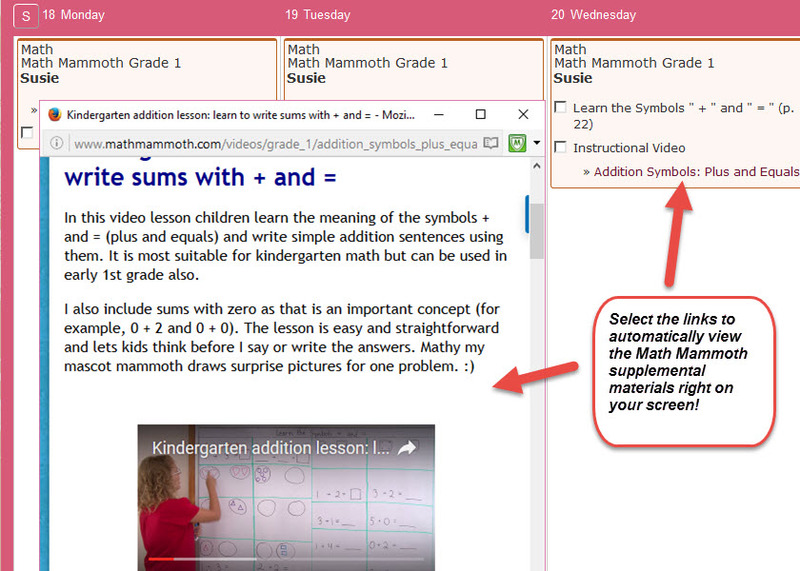 The Math Mammoth Grade 7 (Regular) Lesson Plan assigns the lessons and tests from Math Mammoth Grade 7 curriculum over a period of 188 days. This version is appropriate for parents following the Common Core. It includes the chapter on statistics but not the chapter on the Pythagorean Theorem (in contrast, the grade 7 "Long" version includes both, and the "PreAlg" version includes the Pythagorean Theorem, but not the statistics). The schedule includes one day for each of the 10 chapters for additional review as directed by the parent, and 10 days for the chapter tests, so in reality, the material from the student book is covered in 168 days. The Math Mammoth Grade 7 (Long) Lesson Plan assigns the lessons and tests from Math Mammoth Grade 7 curriculum over a period of 202 days. This "Long" version includes both the chapter on the Pythagorean Theorem as well as the chapter on statistics (in contrast, the grade 7 "CC" version omits the chapter on the Pythagorean Theorem, and the grade 7 "Pre-Alg" version omits the statistics chapter). The schedule includes one day for each of the 11 chapters for additional review as directed by the parent, and 11 days for the chapter tests, so in reality, the material from the student book is covered in 180 days. Maria Miller's recommended course of study for each grade level (see above for details). One-click access to dozens of Maria's own instructional videos, assigned to the matching lessons in the curriculum, as well as many additional Internet resources and games - one for nearly every day of the plan. You can use these resources for additional practice, for review, for illustrations to clarify a concept, or just for fun. PLUS Bundle includes ALL PLUS (Including PDF) Lesson Plans and Lesson Plan Bundle includes ALL Lesson Plans without PDF.